We have carved a niche amongst the most trusted names in this business, engaged in offering a comprehensive range of Tutti Frutti Flavour. 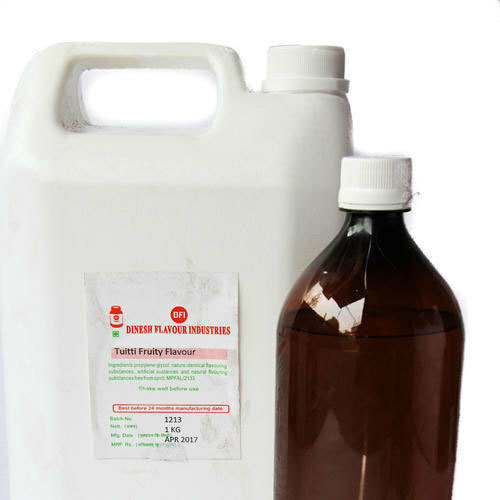 Dinesh Flavour Industries is a highly reputed company of the industry, which has got established with a sole aim of meeting the specific demands of the customers. We have come into existence in the year 1991 and started business as a sole proprietor. The headquarter of our company is situated in Dombivli East, Thane, Maharashtra. Since from establishment, our firm is indulged in manufacturing the best quality range of Food Flavour and Liquid Food Flavor. Our range is processed under hygienic condition by our specialized personnel. We give utmost importance towards the quality of products and therefore, we have adopted several strict quality testing policies and guidelines suggested by the food industry. Our rich experience, the promised of workforce and expertise of professionals has enabled us to climb the high echelons of success.